On Saturday, March 5, the Octagon returns to the MGM Grand Garden Arena in Las Vegas for a championship doubleheader that will have the entire world watching. In the main event of UFC 197, featherweight world champion Conor McGregor looks to make history as one of only three fighters to win UFC titles in two weight classes when he moves up to face lightweight champion Rafael dos Anjos. It’s a Superfight that pits the charismatic Irishman, fresh off a 13-second knockout of Jose Aldo, against Brazil's dos Anjos, who has dismantled Donald “Cowboy” Cerrone and Anthony Pettis in his last two bouts. 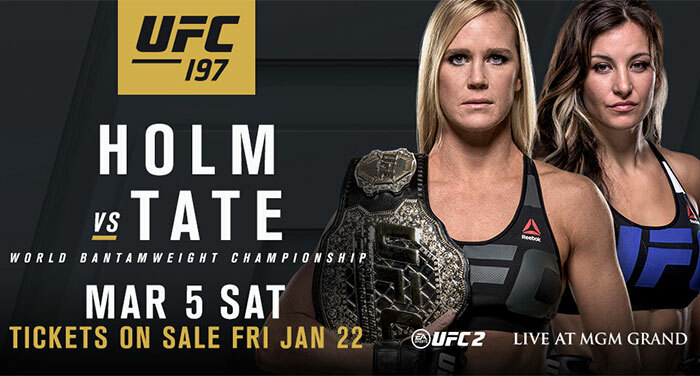 Plus, in the co-main event, UFC women's bantamweight champion Holly Holm looks to follow up her stunning knockout of Ronda Rousey with another big win, this one against perennial contender Miesha Tate, who is hungrier than ever to take the title and cement her fighting legacy. Dublin’s McGregor has been calling his shots in the UFC since his debut in 2013, and the man dubbed by many as “Mystic Mac” has been on target with his Ali-esque predictions. Sailing to the top of the featherweight division in the space of seven fights, the 27-year-old capped off his rise with 2015 knockouts of Dennis Siver, Chad Mendes and Jose Aldo. But the undisputed 145-pound champion seeks more gold, and if he beats dos Anjos on March 5, he will join BJ Penn and Randy Couture as the only fighters in UFC history to win belts in two divisions. More importantly, he will be the first to hold those titles simultaneously. That’s history Brazil’s proud dos Anjos wants no part of, and the 31-year-old lightweight champion has every intention of leaving the MGM Grand Garden Arena with his title on March 5. Showing the best form of his career, dos Anjos has won five straight bouts, most notably knocking out Benson Henderson, decisioning Nate Diaz and defeating Anthony Pettis for the UFC lightweight crown in March of 2015. In his first defense, dos Anjos needed just 66 seconds to dispatch Donald “Cowboy” Cerrone, and he has similar intentions for McGregor when they meet. A three-division world boxing champion, 34-year-old Albuquerque native Holly Holm became the first fighter to win world titles in boxing and MMA when she knocked out Rousey in two rounds at UFC 193 in November. The victory catapulted “The Preacher’s Daughter” into a new realm in terms of public notoriety, but Holm has remained humble, with her only desire being to get back in the Octagon and defend her new women’s bantamweight title. That plan sits well with 29-year-old Las Vegan Miesha Tate, a pioneer of women’s MMA who has earned her title shot with four consecutive UFC wins over Liz Carmouche, Rin Nakai, Sara McMann and Jessica Eye. A former Strikeforce champion, “Cupcake” has cleared some room in her trophy case for a UFC title belt that she hopes to take home on March 5. 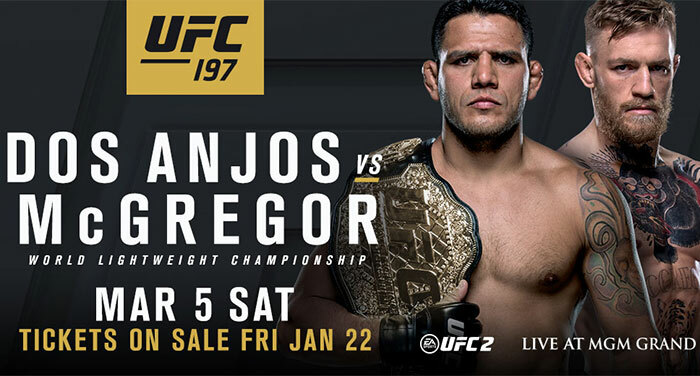 Tickets for UFC 197 will go on sale next Friday, January 22. Stay tuned to UFC.com for more.